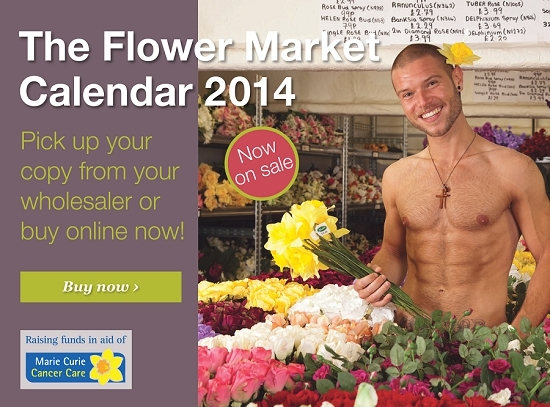 Come and get your hands on the Flower Market's very first 'Cheeky Calendar' and help us raise £10,000 for the fantastic charity, Marie Curie Cancer Care. Twenty of the Flower Market's finest men and women have dared to bare with only strategically placed flowers, foliage or potted plants to spare our blushes. Come and see your favourite traders like you've never seen them before! The Flower Market calendar also includes all the key flower industry dates as well as Dutch holidays so that you can perfectly plan your 2014! The calendars are on sale now from all the traders in the Flower Market and cost just £5 (with £3.50 of every sale going to the Marie Curie Cancer Care). If you can't get to the Market, you can order your calendar online right now and we'll send it out to you. In total, there were 4 seasonal photoshoots over the course of a year, all taken 'on location' in the Market during the usual trading day. Every shoot had an audience, heckling and bantering in classic Market style to make the models laugh. "The shoots were fun!" laughs Bob aka Mr May. "Everyone seemed up for a laugh. Graeme (Mr February) got all his clothes nicked…and it's cold in here!" Barry (Mr October) even stopped traffic, posing outdoors amongst his foliage displays just as a packed Wimbledon to Vauxhall commuter train pulled up in full view. John (Whittingtons), Maurice (SR Allen), Graeme (Zest Flowers), Eddie & Sonny (Dennis Edwards Flowers), Kevin & Paul (Evergreen), Bob (L Mills), Emma (Sells First Impressions), Alex (Alexander Collier Flowers), Richie, Danny & Bobby (Alagar), Sophie Hanna (Sophie Hanna Flowers), Mark, Kirk & Charles (Collier and Company), Barry (Porters), Gary (Quality Plants) and Grant (C Best). Can you match the trader to the body parts below? Comment in the boxes below or tweet us at @MarketFlowers if you think you can see your favourite trader here. And make sure you pick up your copy of the calendar to see if you were right!